Stephen Marcucio served the Derby Little League for over to 30 years. 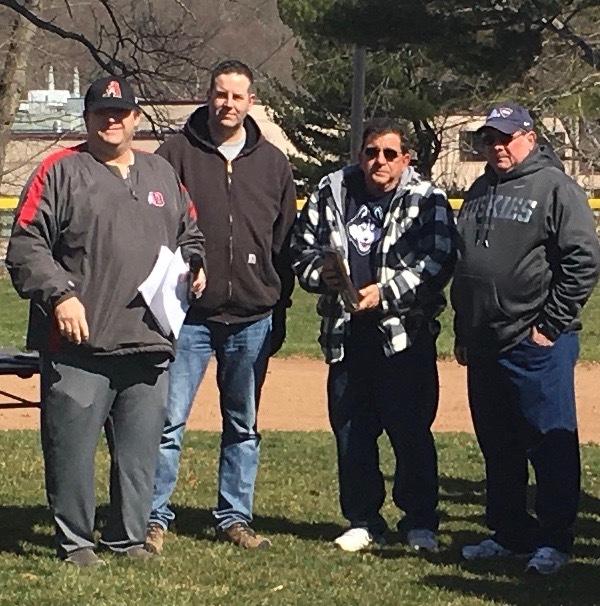 He began coaching in his early years, but then became a member of our Executive Board for many years, also working with Chubby Curtiss and Bill Uluski to help create the strong league we are today. Steve served in many capacities as a member of the executive board. He was a very integral part of the league. He served as Player Agent, Secretary, and Treasurer for many of those years and did the scheduling for the league during most of his time on the board. Steve also coached in the biddy league for many years and served as its director even after he gave up his coaching duties. Presented in memory of Steve Marcucio–in grateful appreciation for the many years of service and dedication given to the youth of Derby. Plaque to be presented to his son Steven Marcucio. His son Fran Marcucio is also present.